With Zendesk Chat-Salesforce integration, agents can create Salesforce cases for customers by clicking a link that appears at the end of each chat. 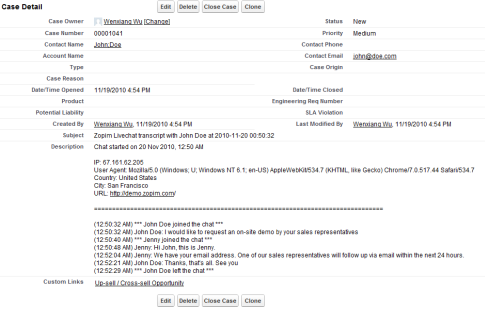 All of the customer's information in Chat, including transcript, country, IP address, and contact information, is automatically pulled into the Salesforce case. In Salesforce, select Setup > Personal setup > My Personal Information > Reset my security token. An email will be sent to you with your new security token. Enter your Salesforce username, security token, and password. "Note: The Salesforce for Chat integration is only supported for standalone chat accounts. Accounts integrated with Zendesk Support cannot use Salesforce for Chat." What is the difference between the two different accounts? Is the account integrated with Zendesk Support the bundle deal?